Decorative X shaped design, open 5 Tiers bookcase enhances modern industrial decor to any space! High level material of REAL WOOD PLANKS and durable steel frame make it an ideal solution for your varied storage needs with its extra large vintage industrial design . Unique "X" design features more stable and durably. And assemble is quite easy for about 10 minutes, a rustic and functional unit can be putted together! a convenient solution to the problem of stacking. Bookcase comes with two packages (one for metal frame, one for wood shelves). If you have any question, feel free to let us know! 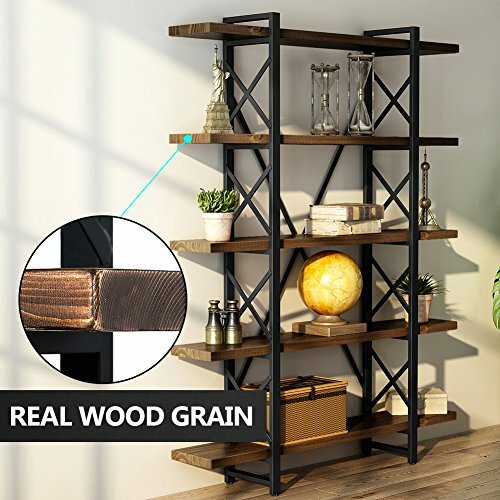 SOLID THICK WOOD: True pine wood shelves (about 1.5" thick planks), rather than some MDF laminated or plastic hollow material that may collapse around easily, solid wood shelving ensure durability in storage and decoration. DECORATIVE "X" FRAME DESIGN: Heavy metal of X-bracing prevents shelf from separating vertically, heavy weight to it and adjustable feet to stabilize on level surface. Top Notch in Aesthetic: Vintage and industrial-style with perfect REAL WOOD GRAIN that would not let you down for a long run! BIG & WIDE ENOUGH: 72.44''H x 11.22''D x 47.24''L, and the clearance between each shelf is about 14.76'', made it an ideal organization that room without looking cluttered or over crowded. If you have any questions about this product by LITTLE TREE, contact us by completing and submitting the form below. If you are looking for a specif part number, please include it with your message.